2. What's a bad diet? 7. What diet has America chosen? 10. Who profits from disease? As you can see, the problems caused by poor nutrition can literally destroy a nation. They reach into every area of society: The economy, education, health care, global competitiveness and even Democracy itself. 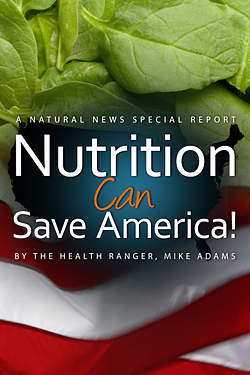 And yet, instead of treating these nutrition problems with a sound nutritional program, the United States of America has chosen to ignore the problem and treat people with chemical prescription drugs. Public Safety: Medicated drivers are unsafe drivers. In the United States today, as much as one-third of all traffic accidents involve medication-impaired drivers. Instead of being alert with the help of healthful foods, our drivers are mentally compromised by meds. Impaired Cognitive Function: This impaired cognitive function continues at work, too, where medicated workers make mistakes, suffer reduced productivity and ultimately fail to perform to their full potential. Deterioration of Democracy: Along with impaired cognitive function comes the inability to vote intelligently, causing voters to repeatedly elect disastrously unqualified representatives to Congress (and other offices). This, in turn, erodes the bedrock of Democracy as dishonest or unqualified politicians betray the future of the People for their own personal gain. More Disease: Medications used to treat one disease today end up causing more diseases in the future (virtually all medications cause some level of liver and kidney damage, and many promote brain and heart damage at the same time). For example, common over-the-counter painkillers cause the deaths of several thousand Americans each year just from gastrointestinal bleeding (http://www.naturalnews.com/019945_d...). Huge Increase in Health Care Costs: During all this, the monopoly pricing of medications causes health care costs to continue skyrocketing, further threatening the financial stability of the nation. Environmental Destruction: After all those medications pass through the bodies of consumers, they end up in the sewage systems, where they are eventually dumped into rivers and other waterways. (Most drugs, such as HRT drugs, are not filtered out by water treatment systems.) These potent chemicals pose a huge threat to aquatic ecosystems and contribute to the destruction of coral reefs and ocean life. Do you see where all this is heading? Higher costs and lower productivity. Increased rates of disease and decreased economic productivity. Environmental destruction. It's not difficult to extrapolate this pattern and see where such a nation might be headed. The accelerating downfall of the United States of America is a textbook example of how a nation rapidly deteriorates under the influence of excessive medication and disease-promoting processed foods.